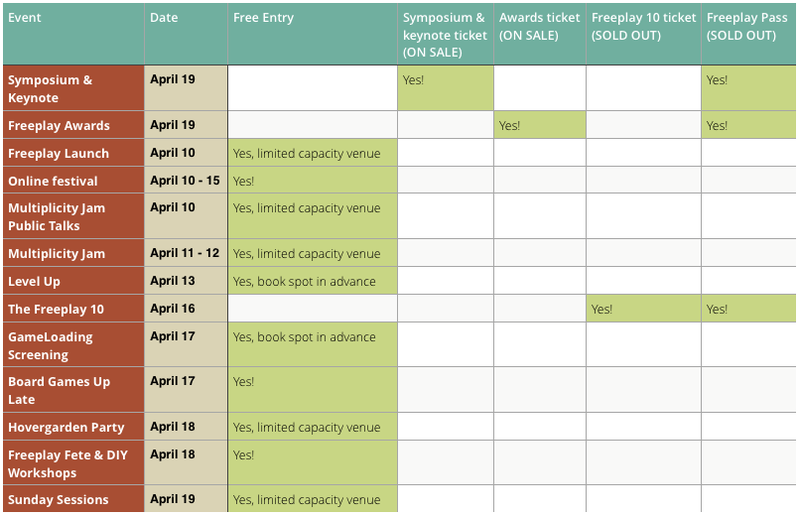 Freeplay has had a huge overhaul this year in terms of what we’re offering, so in the last few weeks before the festival we thought we’d let you all know about how ticketing and access to each event works. Q: A lot of Freeplay is free this year, isn’t it? A: Yes! As you can see from the chart above, a huge amount of this year’s festival is free. That said, a lot of our events take place at venues with limited capacity. In the case of the GameLoading screening and the Level Up event at the Wheeler Centre, you’ll need to reserve a place in advance in order to get in. You can do that by following the links on each event’s page here on the Freeplay site. Other events with limited capacity, like the Freeplay Launch, the Multiplicity Jam Public Talks, and the very popular Hovergarden Party operate on a first-come-first-served basis. Q: I heard Freeplay was sold out! I really wanted to come, how do I get in? A: Well, we’ve sold out of full passes, but as you can see from the chart above, you can still come to the vast majority of the festival. You can still buy tickets to the Symposium—which is the 2015 event most similar to previous year’s Freeplay events, with a keynote address and panels (if you’re coming to Freeplay at all, you’ll want to be at the Symposium). You can also still buy tickets to our Awards party, which is also our end-of-Freeplay celebration event. Q: I really wanted to get into the Freeplay 10 event on Thursday night! A: Sorry, this event really is sold out. Q: What happens if I really want to come to a free event but it’s full before I arrive? A: At some of the events, you’ll be able to queue until capacity becomes available. But in general, you should arrive early or risk disappointment. We’d love to be able to let everyone in but we also have to observe legal limits set by the venue. We anticipate in particular that the Hovergarden Party on Saturday the 18th of April will see high demand throughout the evening. A: Easy! Email ticketing@freeplay.net.au and they’ll sort you out.